What do you guys use in you home shops for general machining. I’m thinking I would like to invest in one, just looking for the right size. Check out Grizzly, I will warn you to stay away from northern tool, they lie, held my $ for over 2 weeks when I asked for refund after they said lathe was in stock and the wanted me to wait 4 months. Hard to beat a good old Heavy 10 or Clausing. If your patient you can find them cheap. My current South Bend 9c only cost me $20.00. Deets066, Semotony, Mkinslow and 1 other person like this. What sizes are you running? My dad was a tool and die maker for 30+ years and the last 10 or so he ran a Cnc lathe. I’m not sure if the size, maybe 24x 60”. It was big. I believe it had a 30hp motor. Anyways. I don’t need digital read out, just something I can turn to make a part or turn some threads. I’m way happy for some old iron that isn’t totally slopped out. Just need a sizeish recommendation. Most guys bring a 10", I got a 11x 26 because the 10"x22 was out of stock at the time. Mkinslow and Homemade like this. Deets066, Semotony, Johnny2063 and 6 others like this. My boss found a Southbend Turnado dirt cheap a few years ago. Being old and 3 phase made it easy to get. And what about this big dog? Johnny2063, angelo c and Mkinslow like this. If you look around ,Craigslist etc . you might find a Southbend or Atlas for a decent price . As luck would have it I have a Monarch 10" EE .Had it not have been cheap I wouldn't have bought it because these are some of the finest toolmakers lathes ever built and bring a premium price .Having said that it's not necessary to have something like this to do saw work . The thing to keep in mind with an Atlas or Southbend is the fact repair parts are readily available because they made many of them . Johnny2063, Dub11, angelo c and 2 others like this. I use a 9 x 20 from Enco. It took some work to even be a usable machine. But.....for 1100.00 it was a bargain. With good chucks and tooling, it does a fine job. Semotony, Mkinslow and Termitebuffet like this. Jimmy in NC, mortalitool, Dub11 and 3 others like this. This might be something to look into. Three phase but a converter is still affordable at this price. 1 1/2 spindle bore should be enough to gunsmith when that hobby come up. Saws and guns....almost as good as beer and burgers. LOMartin, Dub11, Mkinslow and 2 others like this. If you have the space and means to handle/transport it, a used larger lathes can usually be found cheaper. Everyone wants the benchtop Myfords, South Bends and Atlas lathes which drives up the price. Dub11, Mkinslow and angelo c like this. Lathes are similar to chainsaws. Once you start by purchasing one you just gotta have more. I have three working metal lathes and a fourth small collector piece that is small enough to be a wall hanger. 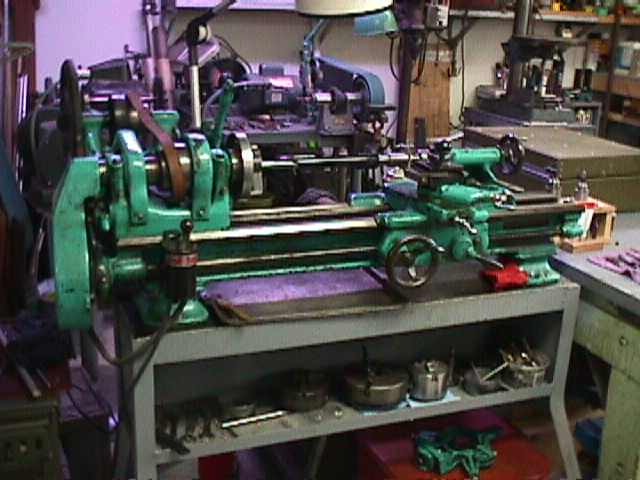 I am an old retired machinist and have a small machine shop in the back yard to play in. 9x24 South Bend made in 1907. Was my Dad's, I hauled it from the Georgia Coast all the way up here to Washington's Olympic Peninsula. Two Jets, a 13x36 belt drive foreground, a 14x40 gear head Jet with Enco badge background. "Smoking" Nothing smells better in a Machine Shop than hot cutting oil. angelo c, ray benson, ManiacalMark and 9 others like this. 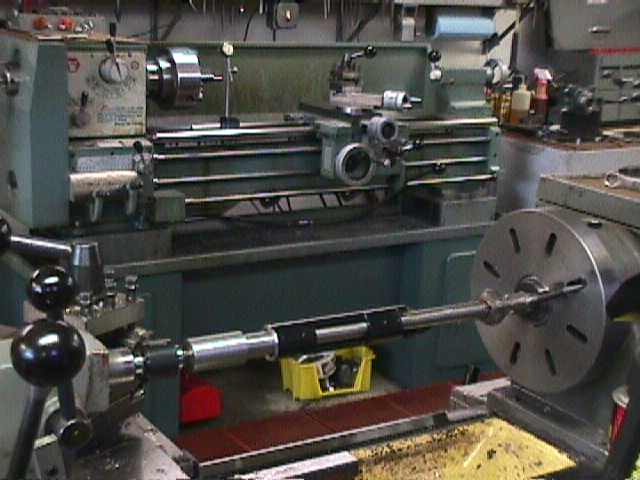 Jet 13x40 gear head lathe. This picture is when I was moving in the mill, so everything is pretty clean and open. Milltronics Partner 00 CNC knee mill. Here I was fitting the mill with the aluminum back splash to keep the chips more contained. cus_deluxe, ray benson, angelo c and 3 others like this. You win. I wish we were neighbors. I'm not very tidy but I have stuff .Pictures of the Monarch 10EE,a Bridgeport model M milling machine and an old Bowes and Emmes circa 1920 20 by 48 lathe .The later I think turned cannon barrels for the cival war,it's old and heavy and noisey . Johnny2063, ray benson, Moparmyway and 5 others like this. I’ve noticed that. Once you get past 10x36 range, the price doesn’t climb as fast as the size grows. Until you get into Cnc capable or digital read out. Same with three phase. That too drives the homeowner market away because they don’t want to mess with a freq drive or phase converter. I’m still on the hunt for one and building my budget. Of course it probable won’t be for a year until I get out of this city *s-word box of a house and into a house with a garage/shop. Johnny2063, Redfin, ManiacalMark and 4 others like this.